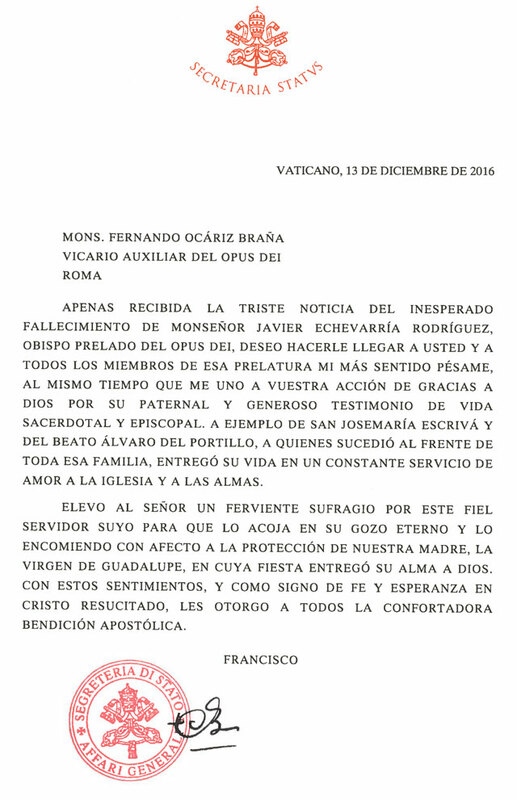 At 8:15 on the morning of December 13, Pope Francis called the Vicar General of Opus Dei to express his closeness on the occasion of the death of Bishop Echevarría. The Holy Father assured him of his prayers for the Prelate during his celebration of the Eucharist and sent his blessing for all the faithful and friends of the Prelature. Some hours later he sent the telegram reproduced above. Having just received the sad news of the unexpected death of Bishop Javier Echevarría Rodríguez, Prelate of Opus Dei, I wish to express to you and all the members of this Prelature my heartfelt condolences, while also uniting myself to your thanksgiving to God for his generous and fatherly testimony of priestly and episcopal life. He followed the example of Saint Josemaría Escrivá and Blessed Alvaro del Portillo, whom he succeeded at the head of this entire family, giving his life in a constant service of love to the Church and souls. I raise up to our Lord fervent suffrages for this faithful servant of his so that He may welcome him to eternal joy, and I lovingly entrust him to the protection of our Mother, our Lady of Guadalupe, on whose feast day he surrendered his soul to God. With these sentiments, and as a sign of faith and hope in the Risen Christ, I impart to all the consoling apostolic blessing. The Vatican, 13 December 2016. Romana, No. 63, July-December 2016, p. 229-232.